The white background of most text editors can cause serious eye strain, especially if you have to read or write large amounts of text. 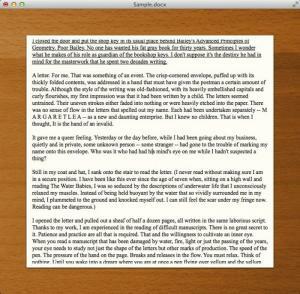 FocusWriter places a comfortable and fully customizable text editing environment at your disposal. You can choose your own colors, go to full screen mode, to avoid distractions and much more. In other words, if you want to read or write on your computer, without any kind of distractions and without tiring out your eyes, this application is definitely worth trying. The appearance of the main user interface is quite pleasant, due to the faded color of its background. Also, the interface has a clean and simple layout. It displays only the text editing area, but you can reveal a toolbar with a few options, by hovering with the mouse cursor near the window's top edge. Additional options can be placed on the toolbar, from the application's general settings menu. FocusWriter comes with all the capabilities you would expect from a text editor, including spell checking, the possibility of changing font and paragraph settings and so on. In addition, the application provides a few other tools, which can be quite useful in certain situations. For example, you can set up timers, if you don't want to get carried away when reading or writing something. Also, FocusWriter allows you to set up daily goals, like working for a certain number of minutes or typing at least a certain number of words. The user interface can be set to full screen mode at any time, with a single click. This can help you focus on your work, without getting distracted by anything on your desktop. Furthermore, you can apply different themes on the interface or create your own custom environment, with your own colors and images. You can read or write text without any distractions. The user interface has a pleasant design and it won't tire your eyes. Also, FocusWriter provides many useful tools, which can make your work more comfortable. The system's menu bar may overlap the application's toolbar, when its interface is in full screen mode. If you care about your eyes and you want to work without any distractions, then FocusWriter is the solution you need.